Blogging started as a hobby for Dr. Arnold Kim. His blog, MacRumors.com, features gossip and facts about Apple. Although it was a time-consuming hobby, he kept at it while earning his medical degree. He completed his medical degree and began to diagnose kidney problems for patients. With his website attracting 4.4 million people and 40 million views per month, he decided to hang up his stethoscope this month and become a problogger full time. According to Quantcast, it has become the one of the most popular technology website to date. Now that he has decided to focus his attention on his blog, Dr. Kim believes the potential to earn more from his endeavor will grow further. As with all other people who are unaware of a blog’s potential, his colleagues could not comprehend how he could make more money from blogging than pursuing his medical profession. He sums it all up in two words, “build traffic.” In the internet, traffic equals power, which in turn translates to money. 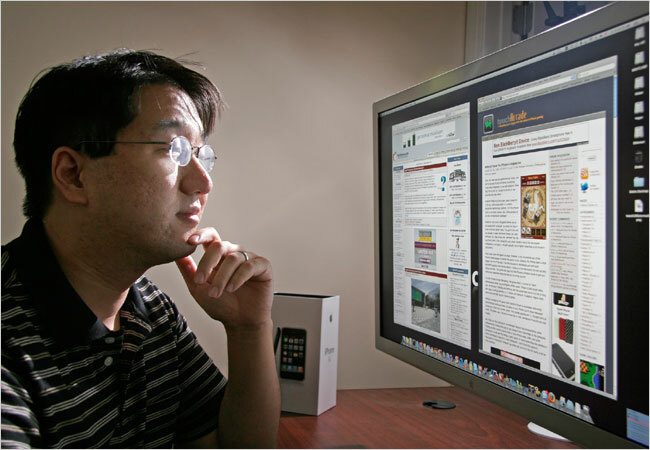 Dr. Kim started blogging about Steve Jobs’ company in 2000 writing about rumors on future Apple products he collects around the web. Being a secretive company, Apple has become the object of speculation and interest over the years. With a computer science degree from the Columbia University, his skills in programming and technology has added value to the blog and made visitors keep coming back for more. He also knew that everyone wants to know in advance what Steve Jobs is up to. If the midnight vigil during the market release of the IPhone 3G is any indication, Dr. Kim has indeed found a niche that was worth more than the degree he is giving up. MacRumors ranks No. 2 on a list of the “25 most valuable blogs,” just behind Gawker Media and ahead of The Huffington Post, PerezHilton.com, and TechCrunch. Among those on the list, 2 tech-oriented blogs, Ars Technica and PaidContent, were sold earlier this year for alleged sums in excess of $25 million. Ars Technica has over 3 million visitors per month while PaidContent and its associate blogs reach approximately half a million people. Considering that MacRumors attracts a far bigger audience, valuations indicate that he has a gold mine in his hands. That is one piece of real estate that no crisis can topple. Initially, he hesitated to make it a full-time job since he enjoyed medicine and had invested almost $200,000 for his education. However, when he saw the figures, it had become an easy decision to make. When asked how he figures out the rumors from the real thing, he claims that its all a gut feel. He is aware that most of the images of future Apple products in the web are fakes. He does enjoy this fun part where he sometimes posts suspicious images with hints on their authenticity. At the moment, he is planning to go beyond the horizons of MacRumors. He is currently cooperating in a spinoff Web site, Touch Arcade, that tracks the new games for the iPhone and iPod Touch. Though he keeps mum about his other expansion plans, one thing is certain — he plans to go where no blogger has gone before.